Two weeks ago I had to minister at a Women’s event about one and a half hours away from my home. I can’t stand being late and knowing rush hour was about to hit I decided to leave two and half hours early. I closed the car door ready to brave the traffic, and then it hit me, “I should have stopped by the refrigerator to grab a cold bottle of water”. After having a partial hysterectomy several years ago I have quite a few heat waves better known as hot flashes. You young girls wouldn’t understand and you faith walkers are praying and binding that hot flash right now. LMBO! Well suddenly it happened! Fire shut up in my bones! I began to roll down the windows, turned the heat to a “mighty rushing wind” of cold air, and scrounged for anything cold to drink. Now please I know ya’ll know all the remedies and I have heard them all but don’t mail me anything because I am not going to take it. I love you though. Just write it in the comment section, because I do read your responses ☺. Now here is the lesson. Why God speaks to me this way I don’t know but it sure ministers to me. As soon as I saw that ice Holy Spirit begin to say, Psalm 138:8a “The Lord will perfect that which concerns me;” Now I know you have probably heard that scripture many times but for me I heard it stronger than ever before. Know that God cares about every detail concerning you! God knows how He made you, He knows what you have need of, He knows your desires, and He is dedicated to exceeding your wildest imagination. What an awesome God we serve! I just wanted a pop and a cup of ice, but the Father is such a show off. It is His pleasure to roll out the red carpet for you; to do things big because He is a BIG GOD! Ephesians 3:20 says, “Now unto him that is able to do exceeding abundantly above all that we ask or think, according to the power that worketh in us,” Whatever you are thinking about right now He can do bigger. It is important that we recognize and appreciate the small stuff. When the big challenges come and you don’t have any small victories you can remember there’s a strong possibility that you will wave a white flag. Do you remember David could recall all the small victories when he went up against Goliath? We have to stop being so busy overlooking all that God is doing in our life everyday. 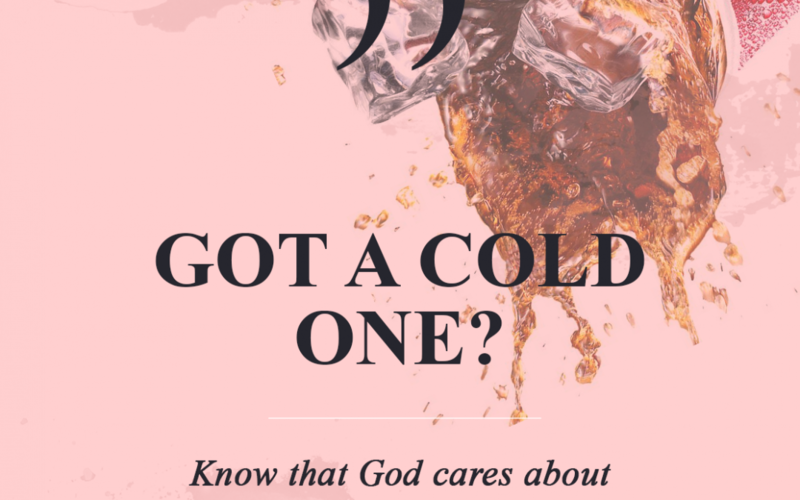 I can now say, “God if you cared that much about a cold one surely you care about my health…”. Start today recognizing and meditating on all of the little things God is manifesting in your life! I thank God for you and your unwavering belief. Receiving alerts just at the right time are not coincidence. Much needed when faced with so many challenges daily. Keep them coming. Peace and blessings! Thank you Dr. Dee Dee. I appreciate you taking the time to minister to us. That word spoke to me this morning. Why stay away from sugar, caffeine and chocolate? Does it make worst? Thank You Father God ..
for you never change.. You are always faithful..
Dr. DeeDee, thank you for this Word! It was right on time!!! He (God) will perfect it! Yes!! Hello, I really like the way you tell a story! I can easily envision exactly what you are saying. I thank God for you and mostly I thank God for being a “Show Off” I am encouraged to expect him to “Show Off” in my life everyday. Awesome testimony Dr.DeeDee I love when our Heavenly Father goes above and beyond, that’s just how he gets down,I’m forever grateful for what he does each and everyday from sending me fresh flowers daily to waking me up with warm hugs and kisses. I love him more than life itself he is a lover like no other. Have a smiley face day. Wow! Pastor Dee Dee that blessed me and as I laughed! … “a good ole cold pop!” God is concerned about me and I thank you for reminding me of the small things. I needed that today! God bless you and your ministry. God had you prepare this perfect reminder for exactly what I needed to hear today. Thank you and peace. Thank you so much for your encouraging words! It makes such a difference and shows you care! Thank you Dr. DeeDee for the reminder of how much God cares about every detail of our lives, and how he considers us in every season of our lives! I appreciate your ministry and your words of encouragement. Amen! God is so mindful of us. Thanks for sharing! Just this Saturday I was going thru some paperwork and came upon my medical files from yesteryear! The many times I should have been dead….but I’m still here. God has healed my body. What faith and a man can do! A little doubt? = no faith. Thanks for the reminder and encouragement not to discount the “little victories ” in life. I love reading your messages. Thank you so very much. Dr Dee Dee, hi how are you? I’m glad I signed up for your blog. It truly is refreshing to hear God through a blog. I got engaged two years ago. Recently, I started to question if this marriage was Gods will for my life. I stepped out of his will to pursue the relationship. Well, just yesterday I went to church and a lady prayed over me. She told me my fear and condemnation was coming from the evil one. She told me God was not looking at my sin, but that I should move out of my finances apartment to avoid going into a marriage full of condemnation and feas. I repented Of muy actions and went back home right away. Well, just today I was reading my word and the Lord reminded me of the scripture proverbs 16:3. I love that we serve such a mighty God that like you said cares about every detail. God bless you! This couldn’t have come at a more perfect time. Facing a Goliath on my job. Thank you Lord for caring about what concerns me. Thanks Dr.DeeDee, you are such an encourager. That shows that it does not always to be something big. Just be greatful for small as well as big things. God bless you! Your not going to believe this but I was meditating on that same scripture this morning and I began thanking the Lord for perfecting that which concerns me. When I look back over my life he has never failed me. What an awesome God! I thank God for you and your ministry, I’m a better person because of your ministry. Love you sister! Good one Dr. Dee Dee! I love how God shows out for His girls…I have had similar things happen to me and I quickly say, “Well Thank ya Fatha”! LOL! Your blogs are so funny and relevant. Keep ’em coming! Dr. Deedee, I truly appreciate your transparency and how you are able to bless not just me but, others as well with your life lesson. Continue ministering the body of Christ. Your ministry is most definitely your assignment! What’s funny is I never liked writing but now I love it. I love reading these comments too. Thank You! Amen!!! Thank you Dr. Deedee for this word. Something major happened in my family this past week and I did remember all of those things that He has already done. So to me, this situation is a drop in the bucket!!! Thank you for always building us up!!! Wow, Dr. DeeDee! God is amazing! My eyes got so big and my mouth was wide open when you said “…the ice began to surface from the bottom…”. God loves us so much that he even cares about the small details of our lives. I call these little surprises God-winks. It’s like God winking at you saying, “Girl, I got you!”. Holy mackerel! You’re dropping major nuggets with this weekly blog! Thanks dear lady! How do you suggest helping a sister whose experiencing lack EVERY month. She’s an old school stylist working in a salon not much clientele. I’ve made large contributions with no chance of ever being repaid. In fact I gave the money without expecting repayment. She’s recently applied for disability as she does have some health issues. Let her tell it she has faith, believes the scripture, all lip service. Every month around the first when bills are do she’s in bed suffering from stress headaches, and deep depression talking about she’s tired of having to go through like this. At this point she’s just recently started to reach out to me as I attempted to encouage her in the scripture, she became somewhat offended and pulled back because she refused to see truth. Now she’s back and I’m EXHAUSTED with her as I seriously can’t speak any other language than English to express there’s a disconnect in her TRUSTING God! She does have local church membership but no FAITH! I just love how you share your life with us.. Thanks for that Word.. Thanks for the on time word, I too was hit with negative news things morning, yet I casted the care upon the Lord, and it no longer was my problem. This give a whole new meaning to “It’s Happy Hour Somewhere”. I too will enjoy a “cold” one. Grace&Peace Pastor DeeDee, You’re such a phenomenal WOG! My husband just the other day shared a very similar reminder to me when I was telling him I’m ready for God to do this and that. He says Sheniada God is doing this and that. He began to remind me of all the small everyday ways God has kept us and our families. I had to say Thanks honey(wink) and smile back at him and God. God is awesome! I say to you too thank you for the reminder to count our many blessings name them one by one on a daily basics. Thank you for sharing that word Dr. Dee Dee. I truly appreciate you. God Bless. That was powerful!! That was the word this Sunday in my church how God can do big things with a little bit. Indeed! Our God IS an awesome God! Thank you so much, Dr. Dee Dee! This was so on time! Might as well think BIG (believing in God)! You are so right. I’m sitting here at my computer thinking of different ways to expand my childcare center. But I have to remember timing is everything. While I’m preparing to make a move God continues to speak and make my vision plain . When God does things it’s not a struggle. He will make your way easy, no fear, no struggle,no strain, no doubt. He does it well. Thanks Dr. Dee needed that message today. Thank you for the Reminder of Who GOD is, and He hears us. I truly enjoy your messages they are an inspiration to my faith walk!! I’ve never met you but I feel as close to you as I did my First Lady in Richmind VA!!! Thank you!! He never cease to amaze me. He is so amazing like that. He is our Jehovah Jirah…Amen! Amen! I love it! I appreciate you Dr. Dee Dee!! We serve a “On time God”!!! Thank you Lord for faithfulness. Dr. Dee Dee may you continue to be a blessING to the kingdom of God. THIS was right on time. He cares about it ALL because He cares about ME. Fantastic! We pray that as God continues to bless you, you will continue to bless us! We love you!! Wow!!!! I stood on this scripture for almost 4 years when my son was incarcerated. I just keep telling him that and believing it for myself. Oh my gracious, that scripture got me through, I remember Pastor Dwayne taught a lesson on getting hold of a scripture and standing on it when going through a trial. And God did perfect that which concerned us during that time. And God still is. This blog just reminded me don’t forget that scripture Gailyann, God is still perfecting that which concerns you. Vashawn Mitchell says it in his song “Turning it around for me” Thank you Pastor DD, I needed this. God bless you!!! How ontime… A wife “standing strong” (at times) in a marriage with a alcohol (since 2009) and now drug addicted (since 2012) spouse. Living seperated off and on for for over 7 years, trusting and standing on the promises of God. God doea perfect that which concerns us. He cares even when the people closet are unable and unwilling to. I left a very lucrative career at the direction of God to find out a month later that my husband was using herion. I was distraught and lacked understanding, but I can assure you that God has seen and carried me through. We are currently seperated we have a son in college over a 1,000 miles away from home. I’m working in social services field helping teen parents gain self sufficiency. As I wondered his I would pay bills, and afford tuition God has provided. In my husbands absence I received an unexpected raise and have been able to afford to help my son in school. Hes staying for summer school and I’ trusting God for a Ram in the bush for this summer tuition. Your marriage ministry has been an encouragement to me as I know God hates divorce, I’m trusting that my husband will be free from the demons that have bound him to self medicating with drugs/alcohol. Through understanding forgiveness is required and reconciliation comes with a price…I stand so other spouses will have the courage to. I have friends are reconciling after divorce and or seperation after they decided to trust God and stand. God will perfect that which concerts you.